Researchers from the University of Birmingham and hospitals across the West Midlands have revealed how a common symptomless condition can develop into the blood cancer myeloma. They discovered that changes in the bone marrow needed for the cancer to grow have already taken hold in the preceding condition, raising the possibility that early medical intervention could prevent this incurable type of cancer from taking root. The research, which was funded by the blood cancer charity Bloodwise, is published today in the journal Leukemia. Myeloma affects the plasma cells, a type of white blood cell that originates in the bone marrow. Diagnosed in over 4,000 people a year in the UK, fewer than half of patients survive for longer than five years after diagnosis. Symptoms often include debilitating and painful bone damage, anaemia and nausea. Myeloma almost always progresses from an apparently benign condition known as ‘MGUS’, which is especially common in the older population - as many as 7% of people over the age of 85 have MGUS. Only around one in 100 MGUS patients will develop myeloma each year and there is currently no way of accurately predicting which patients will do so, or when. Myeloma never spreads to other organs, suggesting that myeloma cells rely on support from other cells in the bone marrow environment to survive. The Birmingham researchers showed that early on in MGUS development, cells that make up the bone marrow connective tissue change their behaviour, and become more supportive of cancer growth. They found that a key gene, called ‘PADI2’ becomes particularly overactive in these connective tissue cells, which leads to the overproduction of a signalling molecule called interleukin-6 (IL-6). 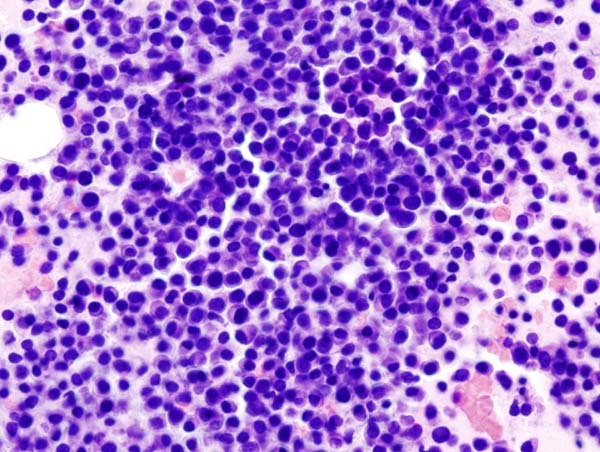 Connective tissue cells release IL-6 into the bone marrow, where it binds with receptors on the surface of cancerous plasma cells, instructing them to multiply rapidly and resist cell death signals. It is already known that the presence of high levels of IL6 in a patient’s bone marrow significantly reduces the effectiveness of a key chemotherapy drug called bortezomib. The researchers believe that drugs designed to target the PADI2 gene in MGUS and myeloma patients could significantly reduce the supportive signalling that myeloma cells depend on, and may increase the effectiveness of current treatments. Significantly, the PADI2 gene has also been linked with the development of other types of cancer, rheumatoid arthritis, Alzheimer’s disease and autoimmune disease, so any drug developed could have wider applications beyond myeloma treatment.